In this blog entry, you’ll learn how to find the cheapest flight deals possible to anywhere in the world using the flight deal website SkySurf.Travel. This is an innovative online service for anyone who wants to go somewhere on a budget, but doesn’t know where exactly. It can also be used for finding the most economical flight path to multiple cities. For example, if your overall flight ticket budget is $500, you can view all your one-way, round-trip, or multi-city flight options for under $500. Let’s say you’re looking to travel around the world, and looking for flight ticket deals whenever you are ready to depart a city. For this example, I’ll be looking for flight deals under $100 departing from Beijing, China sometime in August 2017. I enter in “Beijing” in the “Traveling From” input field, and select “August 2017” in the “Depart Date” field, and finally click on the “Search Best Deals!” button to retrieve a list of results of the cheapest flight deals for the month of August 2017. If I plan on staying in China, I can choose from 19 cities that I can fly to for under $100. If I plan on leaving China, there are 4 countries I can fly to for under $100 (Malaysia, Hong Kong, Philippines, and South Korea). There are a couple ways of finding the cheapest round-trip flight deals. First, click on the “Roundtrip” tab, type in where you’ll be traveling from as well as your departure and return dates. For this example, I’ll be traveling from New York, NY, USA, for one week, so I’ve selected August 16-23, 2017. A list of flights returned that are sorted by cheapest to most expensive. There are 17 countries I can travel to round-trip from NYC for under $500. Four of them are to Europe (Scotland, Ireland, Denmark, and Finland). Another way of finding cheap round-trip flight deals is by repeating the above steps, but this time clicking on the “Show me two one-way tickets that I can book separately” option. You’ll be able to choose your return flight once you choose your departure flight. (This can at times be cheaper). For this option, you’ll be able to see if booking two separate one-way flight deals is cheaper than purchasing a round-trip flight ticket. If you’re flexible, you can also search by month to view the cheapest airfare for any month, or click the “anytime” option to see what the current cheapest destinations are for anytime. In the top navigation, you can also click on the “Flight Map” button to view a world map of all the destinations you can fly to. 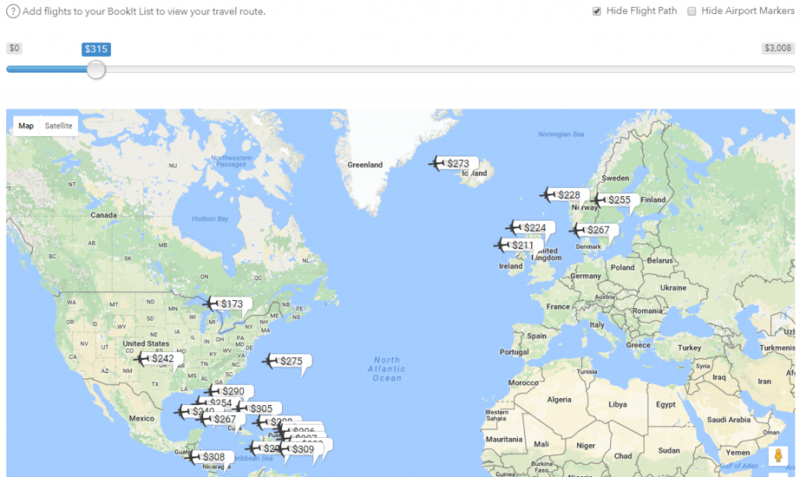 There’s a price range slider to select your max airfare price, and see where you can fly to on a world map. How to Travel by Plane to 17 Cities in Europe for under $500 in One Trip. The options are endless on finding your ideal and most cost-effective travel itinerary. Whether you’re planning a cheap one-way, round-trip, or multi-city trip, SkySurf.Travel is the tool you’ll need to build the most economical flight itinerary to anywhere around the world. If you need help with building your travel itinerary, there’s live online help at SkySurf.Travel.